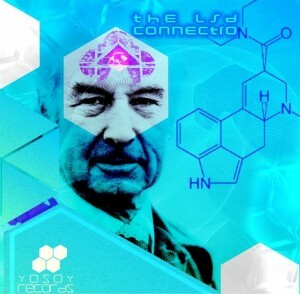 Yo Soy Records proudly presents The LSD Connection, a full-on and new school Goa trance compilation that brings together artists from all around the world to pay homage to one of the great shamans of all time. Expect a deep psychedelic trip through time and space as these sonic wizards peel back the facade of reality and expose the glittering underbelly of the cosmos. Mastering by Dark Fox at Hispanodelicius Studio with cover art by Anastasia. MP3 Download | FLAC Download | WAV Download · Download count: 32,284. WOOOOOW Today again some cool releases!!! ;) Letz Seeeeeeeee BOM! Just awesome release! Great combination of Full-On and Goa Trance tracks. ¡Keep it up Yo Soy Records keep it up! hey I really dig this, i stumbled on GOA music in Peru and this is definitely up there cheers…..where can i find more info about this project. AWESOME tracks from Goalien and Innerself ! ! ! Really happy to see this released, THANK YOU so much to all the artists here involved, it was a pleasure to work with u! lets keep the music free! Really nice material here folks! 5 star release! Keep the beat Yo Soy records!! @Auralious the Goa track has been edited for this compilation and for some reason they included the same version released on Psytraveller compilation :) Greetings amigos. When The Cosmic Winds Collide is great! innerself it is for me. good stuff! Wow i love the track of Godha – Beatiful Experience ! Kicks me every time and goes straight through the ears into my heart! This is my first download off of Ektoplazm and honestly I was a bit disappointed. The Artwork looks amazing , but their was only one song i dug on here and that was Parana’s High Dosage. The rest seemed a bit disjointed and amateurish. Perhaps that’s just me. One of my pet turtle’s favourite comps. Glory to YHVH and His Son YaShUa! Good Vibes !! Greets from germany !! we see us Out there….